When I saw a recipe for raspberry pie filling in the Ball Complete Book of Home Preserving, I have to admit that I was fairly skeptical as to how well it would turn out. It’s a recipe with ClearJel, and if you’ve ever used ClearJel, you know what a gooey mess it can become. I was unsure how well I could maintain the integrity of such a delicate berry, but of course, that didn’t stop me – challenge accepted. So I thought what I’d try was just making one jar at a time. 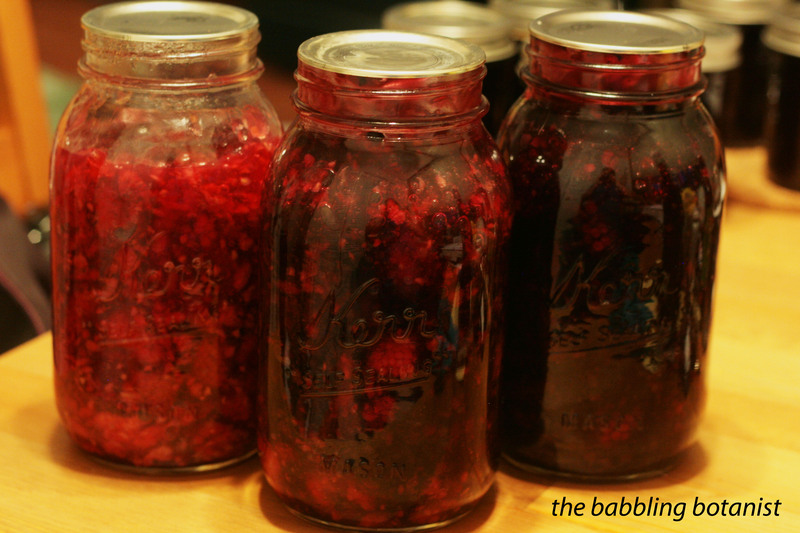 Since I had picked raspberries and blackberries on this particular day, I made a jar of raspberry, a jar of blackberry, and a jar of half and half. I am actually pretty happy with how it turned out! For the recipe I ended up following the extension publication, which was pretty much the same as Ball, but it gives amounts for 1 or 7 quarts – Fruit Pie Fillings extension pub linked to here. Prepare your canner, jars, and lids. Combine the sugar and ClearJel in a large pot and stir. Remember, you can safely reduce the ClearJel or sugar, if desired, so make one jar, see how you like it, and adjust accordingly next time. The lemon juice (added later), should not be reduced. Add water or juice, and cook mixture over medium high heat. It will initially get thick in chunks, and will smooth out to look how it does below. For a few more pictures check out my Cherry Pie Filling recipe. Once the mixture is thick and bubbling, add the lemon juice and boil for one more minute, stirring constantly to prevent burning. Remove from heat, and gently fold in the berries. Doing just one jar I was able to keep the berries fairly unsquished, but if you go for the full canner load of 7 quarts, I make no guarantees. I have done a full batch of blueberries though, and with their firmer texture it works beautifully. The blackberries might be ok too, but I have my doubts on the raspberries. However, mushy would still be tasty! Immediately fill the hot quart jars, leaving a full 1 inch headspace, or perhaps even slightly more. ClearJel will expand a bit and you don’t want to risk jars not sealing over cramming in a couple extra berries. Wipe rims, apply lids, and tighten bands finger tip tight. Process the jars in a boiling water bath canner for 30 minutes (0 – 1000 feet elevation). After processing, remove the canner lid, wait 5 minutes, and remove the jars to a hot pad or towel. Cool 12-24 hours, check seals, label, and store. Below I have the raspberry on the left, blackberry on the right, and the 50:50 combo pie in the middle. Can’t wait to make these into pie! !